Type “Chinglish” into any search engine and you’ll be hit with hundreds of thousands of entertaining examples of Chinese-to-English translations gone wrong. 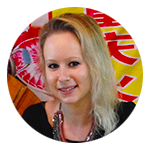 As well as being funny, these mistranslations can also be a great study tool, providing useful clues as to the many differences between English and Chinese that make learning Mandarin a challenge. Last week, I introduced some menu mishaps that can help better understand one of everyone’s favorite topics – food and drink. This week, we’re examining why using Google Translate for everything is not a good idea. Here are some hilarious signs I’ve spotted around China. Seen regularly near low ceilings and doorways, “carefully bang head” is only one of the many wonderful ways 小心碰头 (xiǎo xīn pèng tóu) has been mistranslated – others include “carefulness bump head”, “carefully hits to the forehead”, and the more threatening “look out, knockhead”. So what’s going wrong? Let’s start with the handy Chinese expression 小心(xiǎo xīn) , which can be used to mean “be careful (of something)”, or “look out”. For example, signs reading 小心滑倒 (xiǎo xīn huá dǎo) – “be careful of slipping over” can be found near wet floors. Likewise, when I see someone wandering across a busy road with eyes glued to their iPhone, I feel the urge to shout 小心! (xiǎo xīn!) – look out! The confusion here arises because 小心 (xiǎo xīn) can also be used to mean “carefully”, or “carefulness” – as in 开车要小心 (kāi chē yào xiǎo ) – drive carefully. That’s why signs instructing you to “bang head carefully”, “carefully slip and fall down”, and “fall into water carefully” are common in China. 碰 (pèng) means “bang” or “knock”, while 头 (tóu) is the word for “head”. So, instead of misguidedly commanding you to hit your head carefully, this example should read: “be careful of banging your head”, or more formally, “mind your head”. Yes, sometimes I do feel like beating my phone (usually when the alarm wakes me up at 6.30am). But, unfortunately, that’s not what this sign means. In English, we “call” people on our cell phones, or “use” them as calendars, electronic dictionaries, and music players. 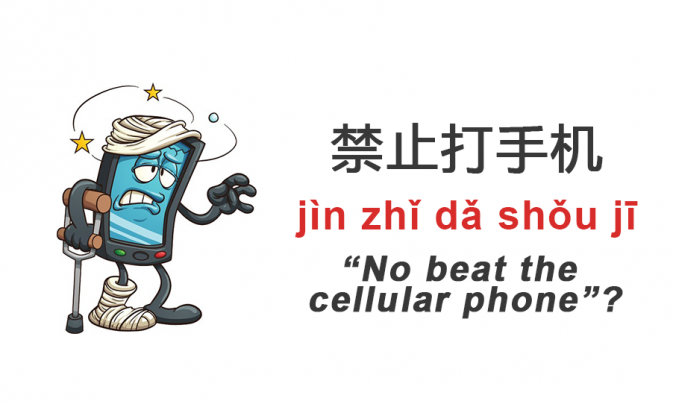 Chinese, on the other hand, employs a different verb – 打 (dǎ) – which is usually translated as “beat” or “hit”. In fact, the meaning of the Chinese word 打 (dǎ) is much broader than the English “beat”. For example: 我要给他打电话 (wǒ yào gěi tā dǎ diàn huà) – I’ll give him a call. You can also 打网球 (dǎ wǎng qiú) – play tennis, 打针 (dǎ zhēn) – get an injection, and 打伞 (dǎ sǎn) – hold up an umbrella. The characters 禁止 (jìn zhǐ) mean “no” or “forbidden”, while 手机 (shǒu jī) (literally “hand machine”) refers to your cellphone. A more accurate translation of this sign would therefore be “using cellphones is forbidden”, or simply “no cellphones”. If I tell you that this sign was found in a public toilet, you may be able to guess what it means. One of the things I love most about the Chinese language is that it is remarkably direct. While in English we shy away from discussing bodily functions – especially on public signage – Chinese just puts it all out there. You might have already come across the character 后 (hòu) – after. Yes, this sign is telling you what to do “便后 (biàn hòu)” – after relieving yourself. Or, more straightforwardly, after using the toilet. The next part – 冲水 (chōng shuǐ) – is fairly simple. 冲 (chōng) means wash, flush, or rinse, while 水 (shuǐ) is water. Literally, “after relieving yourself, flush with water”, although in English we’d probably be extra polite and just say “flush after use”. This reminder is particularly important in China as many bathrooms don’t have automatic or button-press flushes, especially in smaller towns. Instead, you need to fill a small pan of water and 冲 (chōng) it into the toilet bowl. One of the first words I learned after coming to China was 超市 (chāo shì) – supermarket (i.e. home of the all-important Diet Coke, deodorant, and other things that are tough to find in small Chinese convenience stores). What I didn’t expect to see, however, were large signs pointing toward the “Supermarket Export”. Without any context, it’s pretty difficult to figure out what this means. In fact, this puzzling sign is the result of a fairly simple translation error – 出口 (chū kǒu) (literally go/come out of the mouth) means both “exit” and “export”. So, this should be “supermarket exit”. Conveniently, the opposite 进口 (jìn kǒu) – entrance can also be used to mean “import”. Easy! That’s it for our collection of awesome Chinglish phrases – do you have any of your own to share with us? Have any questions about Chinese signs or characters? Tell us in the comments section!